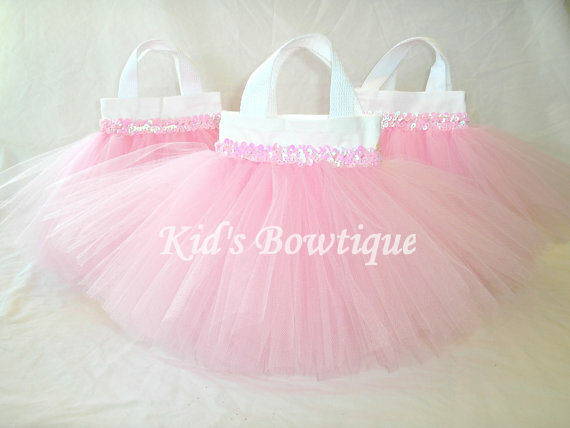 These are Kid's Bowtique ORIGINAL tutu bag designs! 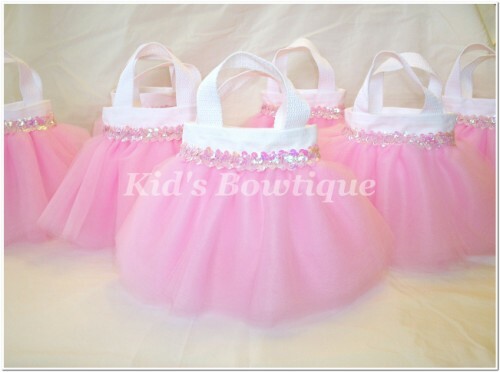 Our unique Sweet Baby Pink party favor tulle tutu skirt bags (in 6X5 size) are made of white canvas for durability, pink tulle tutu skirt for uniqueness and pink sequins trim for dazzle. All accents and trims are sewn onto the bag for durability. The pink tulle can be sewn as our ballgown skirt style (top picture) or dance tutu style (bottom picture). Size: Each bag measures approximately 6X5. NOTE: Production time on party favor bags is 3-5 days and then shipped. For special quantity and date request, please email us prior to ordering.